I have just attended a small opening ceremony of one of the first of over 60 fast chargers that are being installed in motorway services (highway rest stops) around the UK this year. A fast charger puts 440 volts at about 70 amps into the battery, meaning that it can charge a completely empty battery in under 30 minutes. However in my experience, I plan to have 20-30% when I reach the fast charger meaning it takes about 10-15 minutes to re-fill. As the battery fills, the amount of juice being pumped in drops down to about 250 volts at 20 amps. I've had many questions about this system damaging the battery, Nissan, Renault, Mitsubishi and Peugeot all say this is not the case (all their cars can use a fast charger) particularly in mild climates like the UK. If you drive a Leaf in Arizona in the summer the battery is already so hot that fast charging can damage it over time. We don't really have that problem here. Also, if you only ever charged your car using a fast charger there may be some long term problems, but I use it once, maybe twice a week max so it really isn't an issue. I have travelled well over 20,000 miles in the Leaf and if anything I've experienced the range increase, this is, to be honest, mainly due to me being better at driving it. There is no charge to use this system, Ecotricity aren't charging a penny. I have just driven to London, up to South Mimms (where the picture was taken) then back home (186 miles) for a total cost of around £1.20. That's what it cost me to charge the car at home for the first leg of the journey. Does the electricity all come from coal? Another common question, in the UK about 27% of our daytime electricity comes from coal, at night that drops to about 15%. I charge at night. It's worth banging on about one of my other obsessions, that of the amount of electricity from coal that goes into the refining process. Yes, oil refineries use a lot of electricity, somewhere between 4 and 7 kWh per gallon. 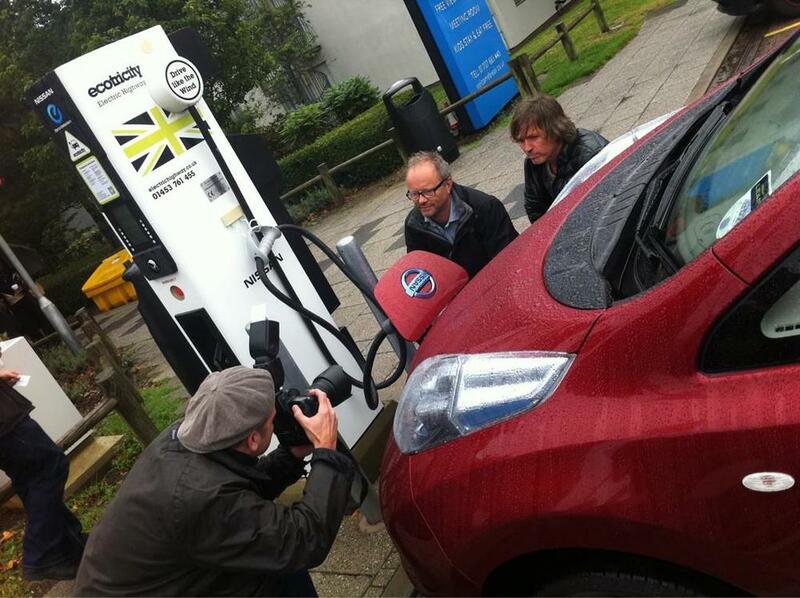 Also, the company supplying the power to the fast chargers, Ecotricity, are one of the countries leading zero carbon electricity generators, Dale Vince (the the man I am posing for the press with) is the boss of Ecotricity and currently the electric car land speed record holder.